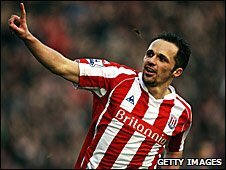 Matthew Etherington has been named player of the year by the players and supporters of Stoke City. The former West Ham winger, 28, has enjoyed an outstanding season, scoring six goals in 36 games and being touted for a call-up to the England squad. Etherington joined Stoke from West Ham for £2m in January 2009 and has helped the Potters establish themselves as a Premier League club. Robert Huth was voted by the coaching staff as their player of the season. Ricardo Fuller picked up the awards for goal of the season, for his solo effort against West Ham in March, and for being the club's top goalscorer for the third year in succession, while teenage striker Louis Moult was named as the academy player of the year. The awards were presented at a special public ceremony, which was held at the Britannia Stadium on Sunday. "It has been a fantastic night when the whole club has come together to celebrate," manager Tony Pulis told the official website. "This shows the tremendous unity we have, which has got us where we are today."